The distribution media contains sample files to expedite getting started with the SBC. It is suggested that new users start with the SBC_Sample_Team.xls file. This file is populated with roster entries, player game stats, division standings and schedule entries. This file will allow the user to get familiar with the structure and commands. The user can then set up a new team by running the File / Configure New Team command. Alternatively, a copy of the SBC_Blank_Team.xls can be used. 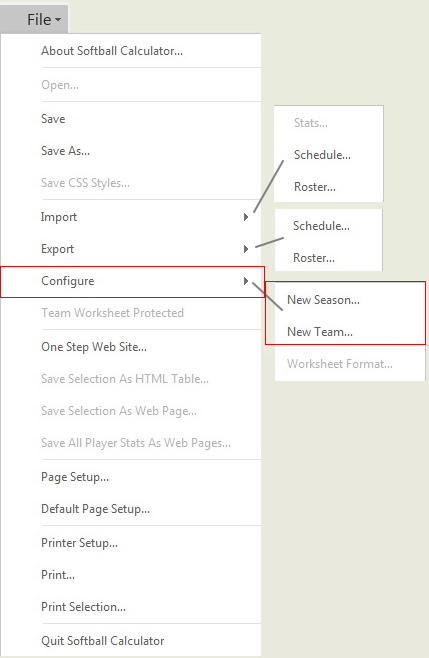 If you already have your Team Worksheet configured from a previous season and wish to set it up for a new season or tournament, run the File / Configure New Season command. This command will preserve the player names in the roster and teams in the standings. The details of these operations are described in Section 2 of the User Manual. 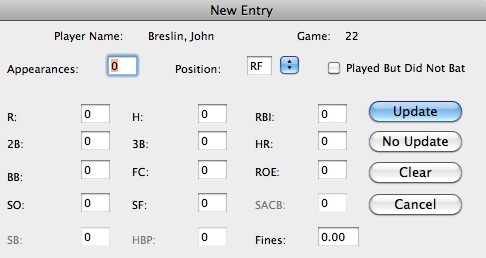 The Player menu contains the commands used to create and maintain the roster entries for your team. Players can be entered into either the active roster or expansion roster. Each player in the active roster has their own detailed stats page. Players in the expansion roster appear in a composite page. The expansion roster title can be renamed as desired (e.g. : Reserves, Substitutes, Alternates, Drive-By's, etc.). The number of players in either roster is unlimited. The Add Player to Roster command is used to add new players to the rosters. A roster may be imported from an external source by using the File / Import Roster command. Roster modifications and maintenance can be made via the other commands in the Player menu. 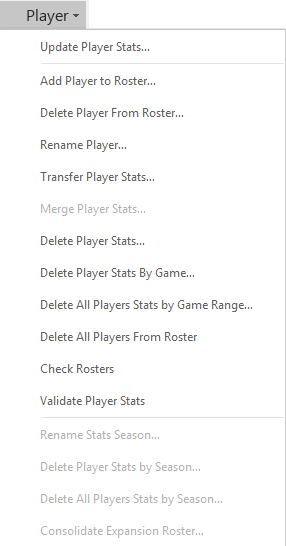 The Transfer Stats command allows players and their stats to be moved to/from the active and expansion rosters as desired. The Merge Player Stats command allows the stats from two different players to be combined into a single player entry. The game scoresheet is the source for the batting statistics for each game. In Expanded Commands mode, game stats can be imported from a number of mobile stats apps. The Player / Update Player Stats... menu command is used to transcribe the individual player stats into the team worksheet. This command is also used for making changes to existing entries for a particular player and game. This command invokes the Select Player Name and Game dialog box. The game of interest and the first player name is selected by this dialog. Players from the active or expansion roster (renamed Substitutes in this example) can be selected via the dropdown menu. After the game and player name have been selected, the Player Update dialog will appear. The drag bar will indicate whether this is a new entry for this player/game selection or an update to existing stats. The dialog is constructed for rapid entry of the player statistics with the fields in the same order as found in most scoresheets. The values will be sanity-checked to catch most data entry errors. After the stats have been entered/updated, the SBC will prompt the user for the next player in alphabetical sequence. The user may choose to go to a different player/game entry as desired. Game statistics are exported from the mobile app into a file. The actual export procedure varies by the app. The File / Import Stats menu command is then invoked. A dialog will appear with some basic parameter selections. The importer will merge the stats for each roster player into the SBC. Players not found in either SBC roster will be added. The new player entries will be flagged for the user to take appropriate action after the import has completed. To aid in setting up the mobile app, the File / Export Rosters command can be used to transfer the SBC rosters into the mobile app. 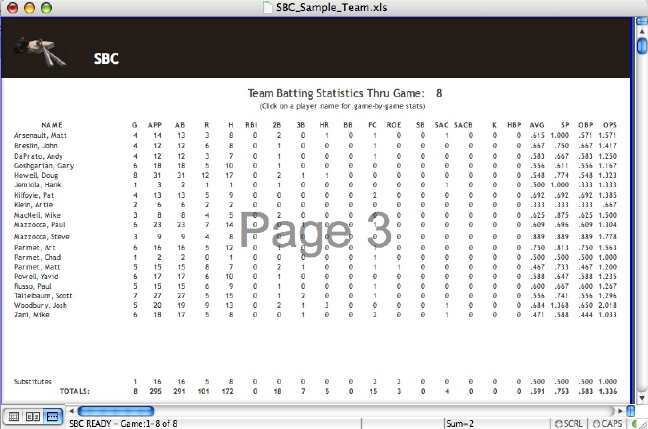 The SBC maintains a game-by-game statistics area for each active roster player on the team. A separate composite stats page will contain the entries for all players in the expansion roster. The user has the option of viewing these entries sorted by player name or by game number as desired. The SBC collates composite player statistics from the game-by-game stats for each active player on the team. A composite of the expansion roster players stats ("Substitutes" in this example) is also calculated.